The New American Bible is the most widely used Catholic Bible version in the U. S. today. The Weekday and Sunday Mass readings are taken from the NAB version, and the U. S. Bishops have endorsed it for use in Catholic Church and school religious education programs across the country. 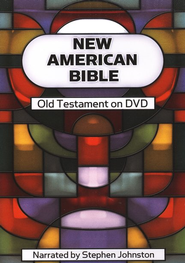 With over 60 hours of narration and almost 7,000 unique scripture screens, the NAB Old Testament on DVD features Emmy-Award winning narrator Stephen Johnston. His crystal clear, mellow baritone voice provides distinct pronunciation, in and easy-to-understand style.